Osteoarthritis of the ankle joint commonly arises as a result of sports injuries or as posttraumatic arthritis. Ankle arthrodesis is the conventional treatment for osteoarthritis of the ankle joint with severe pain and limitations in daily activity. However, due to the development of surgical instruments and implants in combination with continuous studies evaluating postoperative complications, rapid progress in total ankle arthroplasty procedures has recently been achieved. However, on performing total ankle arthroplasty, numerous variables, such as ligament balancing, preoperative malalignment, and arthritis, in nearby joints should still be considered. Avoiding and overcoming postoperative complications (e.g., postoperative infection, malalignment, osteolysis, subsidence) are important aspects that must also be considered. Precise diagnosis and preoperative planning can lower failure rates. 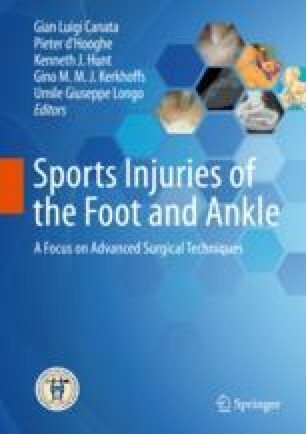 In this chapter, we introduce the history of total ankle arthroplasty, patient selection for total ankle arthroplasty, implants, precautions during surgery, and surgical approaches.